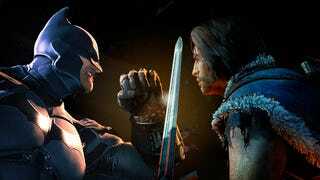 The enjoyable fighting system in the superb Warner Bros.-published Lord of the Rings game Shadow of Mordor is clearly inspired by the enjoyable fighting system in the superb Warner Bros.-published Batman Arkham games. Let's compare, shall we? I'm using the square button for strikes and the triangle button for counters. I'm flipping over enemies with X and stunning them with circle. Stuns let me unleash a speedy barrage of strikes. I'm also rolling/dodging and building a combo-meter. I'm trying to daze enemies, if I can. When they're dazed, stars appear above their heads. Ideally, they'll get knocked down, at which point, a two-button press lets me attempt a finishing move. I'm about a third of the way into the game, by the way, so I have some special abilities unlocked, including the nifty one that lets me stun enemies while I vault over them. Next, here's some footage of me playing Batman: Arkham City, captured off of my Xbox 360 this week. Please forgive my rustiness. I hadn't played the game since May of 2012. Since I'm playing on the 360, the names of the buttons I'm using are different, but the layout maps almost perfectly. I'm using the X button (would be square on a PlayStation controller) for strikes and the Y button (triangle on PlayStation) for counters. I'm flipping over enemies with A (X on Playstation) and stunning them with B (circle on PlayStation). Stuns let me unleash a speedy barrage of strikes. I'm also rolling/dodging and building a combo-meter. What to make of this comparison? It's all for the best, in my estimation. It's about as objectionable as two first-person shooters using similar sprint/prone/cover/lean systems. If another game does something well, why not use it? And, hey, if it's from the same publisher, it's probably easier to be more liberal with what you borrow. With Mordor, it's a good thing. Rocksteady Studios's combat design for the Arkham games is one of the best melee fighting systems in gaming. It's well worth copying or building upon, which is what it appears Monolith has done for their Lord of the Rings adventure. There are certainly differences in the games' combat systems. Mordor features a last-chance counter-attack system that challenges you, when you're knocked down and about to die, to execute a final well-timed button press to get you back to your feet. There's nothing like that in the Batman games. The Arkham adventures provide Batman with a lot of gadgets like a grappling hook that allows him to swoop into and out of his fights. Mordor gives you a bow and arrow for long-distance kills. Arkham gives you Batarangs, although...you can unlock throwing knives in Mordor. Well, anyway, they're similar but different! More importantly, they both play really well and have more to offer than their melee combat mechanics. Now you can see the comparison for yourself. Which Warner Bros.-published game will use this combat system next?